Hey there! Thanks for dropping by DIRECMOOD! Take a look around and grab the RSS feed to stay updated. See you around! 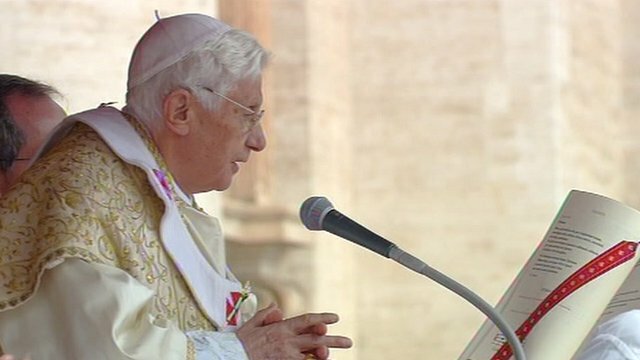 Pope Benedict XVI has delivered his traditional Easter message of peace in front of tens of thousands of pilgrims in St Peter’s Square in Rome. He urged Syria’s government to end the bloody year-long conflict, and spoke of the trouble in Nigeria and Mali. At a Mass on Saturday, he warned that mankind is “groping in the darkness, unable to distinguish good from evil”. Earlier, the Vatican confirmed the Pope would be travelling to Lebanon for a three-day visit in September. “May the risen Christ grant hope to the Middle East and enable all the ethnic, cultural and religious groups in that region to work together to advance the common good and respect for human rights,” said Pope Benedict during his traditional “Urbi et Orbi” (To the City and the World) Easter message. He voiced hope that the “many refugees” currently in need of humanitarian assistance “find the acceptance and solidarity capable of relieving their dreadful sufferings”. For the West African nation of Mali, which was plunged into political crisis after army officers seized power in a coup two weeks ago, he said “may the glorious Christ grant peace and stability”. And for Nigeria, which has been hit by inter-religious and ethnic violence, “may the joy of Easter grant the strength needed to take up anew the building of a society which is peaceful and respectful of the religious freedom of its citizens”. However, as he spoke, reports were coming in of a deadly car bombing close to a church in the Nigerian city of Kaduna. The theme of the Saturday evening vigil was the contrast between darkness and light. The service was brought forward from its traditional midnight start in order not to tax the 84-year-old’s strength – and he was wheeled on a raised mobile platform along the central nave of a darkened St Peter’s Basilica carrying a single lighted candle, symbolising the resurrection of Jesus Christ. Gradually, as other believers lit their individual candles from a single flame, St Peter’s was flooded with light, the BBC’s David Willey reports from Rome. During the Mass, the Pope also baptised eight new converts by pouring water over their bowed heads. The pontiff’s official schedule – which recently saw him return from visits to Cuba and Mexico – is taking a toll, our correspondent says. His elder brother in Germany has said that Pope Benedict – who turns 85 later this month – intends to cut back on foreign travel, as it wears him out. However, the Vatican has confirmed the Pope has accepted an invitation by religious leaders in Lebanon to visit the country for three-days in September. Easter is one of the most joyous celebrations in the Christian calendar, marking the crucifixion and resurrection of Jesus Christ. « KIM KARDASHIAN KANYE WEST Relationship Awaiting For Years Now!